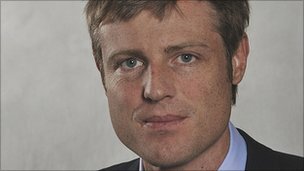 Zac Goldsmith has said he will not stand as a Conservative MP at the next election if the party supports a third runway at Heathrow Airport. The Richmond Park and north Kingston MP opposes the runway, arguing that the focus should be on improving how Heathrow manages its flight capacity. But fellow Tory MP Tim Yeo said a third runway was necessary for Britain to remain economically competitive. A consultation on UK aviation is due to report back in the summer. Mr Goldsmith, who is a well-known environmentalist and was the editor of the Ecologist magazine for nine years, added: “I wouldn’t stand as a Conservative on that manifesto, it’s just not something I would do. London Mayor Boris Johnson also opposes a third runway at Heathrow, but has campaigned for a new airport in the Thames Estuary which has been dubbed “Boris Island”. “I don’t see any technological solution on the horizon which could see us change our minds,” she said. “I see us opposing a third runway,” the Conservative MP for Chipping Barnet added. Mr Yeo, MP for Suffolk South and a former environment minister, believes Heathrow needs to expand so Britain has an international airport that is even more globally connected, particularly to expanding markets such as in Asia. “We have to have good links to them if we are to remain competitive,” he said. There was also a discussion on the Sunday Politics on BBC between John McDonnell MP and Michael Bishop, on Sunday 10th June. John McDonnell sets out the arguments against a 3rd runway very clearly. Former BMI airline boss Michael Bishop, now Conservative peer Lord Glendonbrook, said a new ‘Boris Island’ airport in the Thames Estuary would be in the wrong area and lead to Heathrow closing to pay for it. But Labour MP John McDonnell, who represents Hayes and Harlington in west London, said expanding Heathrow would be “devastating” and lead to job losses, as he called for existing airports to be linked by rail.